Siena is one of the most famous Italian cities and a place every tourist aims to visit during a trip to Tuscany. It is famous for its Palio that take place twice a year, and for its characteristic narrow streets flanked by brick buildings. The historic city is listed as a world heritage site by UNESCO and is filled with beautiful and interesting places to visit. But imagine you have just one day in Siena: what are the things you shouldn’t miss, on any account? Piazza del Campo dominates the city centre and is the starting point of every visit. It is one of the biggest medieval squares in the world and has an unmistakable peculiar shell-shape. Every year on July 2 and August 16 the famous Palio Horse Race takes place here. 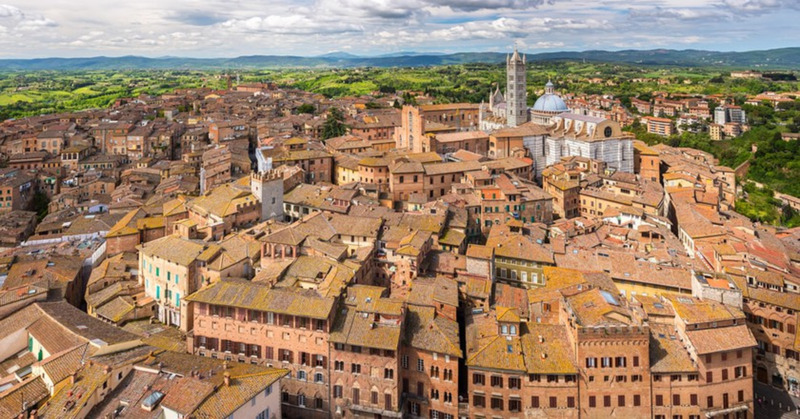 Since 1300, it has been the center of life in Siena and, an active market and place where the Sienese gathered during important political events, as well as for parties and celebrations. At the top of the square is the Fonte Gaia, one the most beautiful fountains in Siena (the one in the Piazza is a copy, while the remains of the original are preserved in the Museum complex of Santa Maria della Scala). Torre del Mangia takes its name from Giovanni di Duccio, its first guardian, whose nickname was “Mangiaguadagni” (literally ‘earning eater’), as he spent all his earnings eating in the taverns of Siena. If you are afraid of heights, you might not want to venture up the 88 meters (400 steps!) of the Torre del Mangia, but you’ll miss a wonderful view. From here the sight is truly breathtaking. You can see all of Siena: Piazza del Campo, the Cathedral a little further away and beyond, the distant hills. The Cathedral has a mostly white and black façade. The best part of this church, which is dedicated to the Assumption, is its interior: the floor, full of esoteric symbols and religious stories; the Piccolomini Library with frescoes by Pinturicchio; the Piccolomini Chapel, where Michelangelo worked from 1501 to 1504, carving the statues of the four lower niches. Don’t miss the pulpit by Nicola Pisano, with Biblical scenes and the Life of Jesus. The Baptistery. Located just behind the Cathedral, the Baptistery, built in 1325, is one of the most important religious sites in the city. For many centuries all the inhabitants of Siena, famous or not, were baptized under the rib vault of the Baptistery. Inside you can admire frescoes and the bronze and marble baptismal font, located right in the center of the Baptistery. The Public Palace of Siena is the place of Siena’s political power: all the rulers of Siena have lived here. In the Palace you can find the Civic Museum of Siena, with its famous frescoes by Ambrogio Lorenzetti representing the Allegory of Good and Bad Government. The Civic Museum of Siena contains one of the world’s most famous allegories: the Bad and the Good Government by Ambrogio Lorenzetti, painted on the walls. The Church of San Domenico is characterized by the massive architecture and the relic of the Holy Head of Saint Catherine from Siena. The most important part of the church is the St. Catherine Chapel in the middle of the right nave wall. The chapel has frescoes by Il Sodoma. Food in Siena: you can find many traditional dishes in Siena. Wild boar, Cinta Senese and hare make for delicious croutons, pappardelle pasta and grilled meat. Then there are local sausages, cheese, liver, ribollita soup and more. Siena and its province also have great wines: Chianti, Brunello di Montalcino, Montepulciano and Vernaccia di San Gimignano. There is also plenty of choice for dessert: cantucci biscuits, Ricciarelli, Panforte and Cavallucci, accompanied by the classic Vin Santo. Siena by night: Siena doesn’t offer the attraction of a big city but, after a day spent visiting museums, churches, palaces up and down the steep streets, you’re unlikely to have the strength or desire to go to a club. I suggest a good dinner at a restaurant and then a slow stroll through the narrow streets.